Craving an over-the-top summer action adventure for some mindless entertainment? 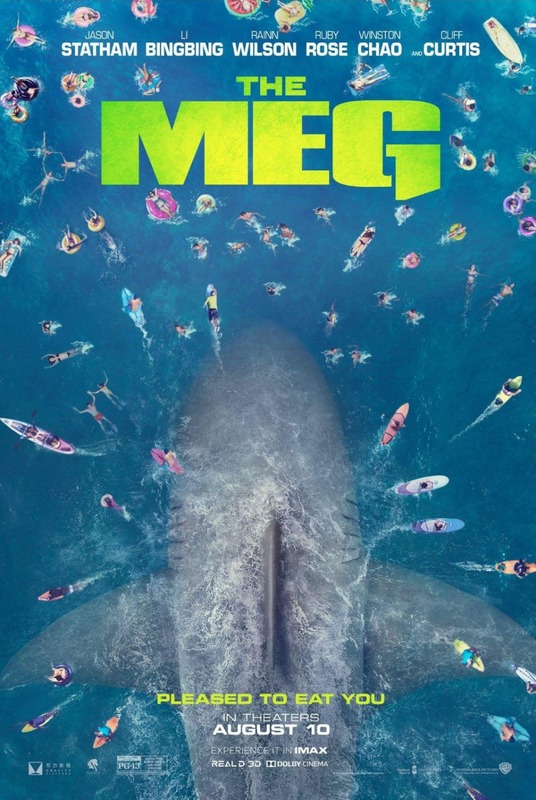 Well, look no further – THE MEG, a film about a giant killer shark on the loose, is hitting theaters just as summer is coming to a close. Will this make a giant splash at the box office or just sink to the bottom of the ocean? Five years ago Captain Jonas Taylor (Jason Statham) aborts a mission to rescue a crew trapped in a submarine because something unknown attacked the ship. Put to shame by his peers, believing that Jonas took the coward’s way out and left his colleagues to die, the sea captain abandons his career and chooses never to enter the water again. A few years later, scientists inhabiting a high tech undersea laboratory are exploring the depths of the ocean to discover what lies miles below what was once believed to be the ocean floor. A submersible being piloted by Lori (Jessica McNamee), Jonas’ ex-wife, loses communication with the lab when it is attacked by some unknown force. Lead scientist Zhang (Winston Chao) along with his partner Mac (Cliff Curtis) track down Jonas and plead with him to help them rescue their counterparts. At first Jonas, suffering from the nightmare of what happened during his last rescue mission, refuses to aid in the operation. But when he realizes Lori is trapped he drops everything to save the day. With the help of Suyin (Li Bingbing), Zhang’s daughter and experienced marine biologist, Jonas rescues Lori. During the excursion the rescuers manage to crack open a pathway for a prehistoric creature to reach the surface. Much to their horror and surprise, the inhabitants of the underwater lab discover that they have unleashed a Megalodon. This 70-foot killer shark breed once thought to have been extinct is wreaking havoc on anything that crosses its path. Jonas is now in a race against time to stop the ferocious sea creature from inflecting terror. So let’s start off listing a few (and I say just a few) of the positives. Some of the action sequences in which Statham is battling the shark are super fun to watch. The Shark trying to swallow things whole as humans try to out maneuver the beast, keeps the film moving at a fast pace. The action will keep audiences pretty entertained and the shark is effectively menacing making it an appealing monster to defeat. Now let’s talk about the downside of this summer movie. The script is horribly written and delivered by extremely poor acting. The timing of dialogue that should have packed a punch or comic relief by the cast was completely off. Moments where characters should shine were more cringe worthy than stellar. It felt like all of the actors in the film were still reading their lines during rehearsal when someone accidentally started filming. There were missed opportunities to establish chemistry between Statham and McNamee’s characters and the budding romance with Statham and Li Bingbing felt unnatural. Not to mention the lost golden opportunity to bring to life a villain in the corrupt billionaire played by Rainn Wilson. With absolutely no character development, THE MEG felt extremely stale and flat. Many of the one-liners are very cliché offering nothing fresh. The only interesting member of the cast is the CGI-generated Shark. The convoluted storyline starts off on a serious note then tries to be a comedy, but the two themes never come together effectively. Things seemed to be moving in the right direction when the tale starts in an offshore facility, but once the drama moves inland to a crowed beach it just unravels from there. Many extraneous unnecessary elements are thrown in that completely derail this production. If the movie is not taken seriously, then some moviegoers will enjoy it just because it is so bad. Otherwise, swim as far away from THE MEG as you can unless you want to find yourself drowning in one of the most ridiculous nonsensical action adventure sea faring movies to hit theaters this (or any) summer.